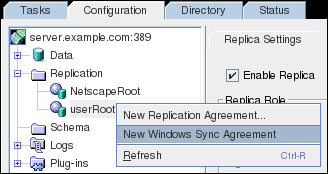 Configuring synchronization is very similar to configuring replication. It requires configuring the database as a master with a changelog and creating an agreement to define synchronization. A common user identity, a sync user, connects to the Windows sync peer to send updates from the Directory Server and to check for updates to sync back to the Directory Server. To synchronize passwords (which is the only way for users to be active on both Directory Server and Active Directory), synchronization must be configured to run over TLS. Therefore, this configuration section assumes that TLS must also be configured. Configuring synchronization over TLS is also similar to configuring replication over TLS. Both sync peers must be configured to trust each other for encrypted sessions (all password operations are performed over TLS). All synchronization for user and group entries is passive from the Active Directory (AD) side; it is the Directory Server which sends updates on its side and polls for updates on the AD domain. For passwords, the AD server requires a separate password service; this service actively sends password changes from the AD domain to Directory Server. The full instructions for configuring the Directory Server to run in TLS are at Section 9.4.1, “Enabling TLS in Directory Server”. Basically, the Directory Server needs to have the appropriate TLS certificates installed, be configured to run over an LDAPS port, and allow client authentication from other servers. You can configure synchronization only with AD domain controllers. Additionally, password complexity must be enabled in AD. Open the Group Policy Management console and create a new Group Policy Object (GPO). For details, see the Windows documentation. Right-click the GPO, and select Edit to open the Group Policy Management Editor. 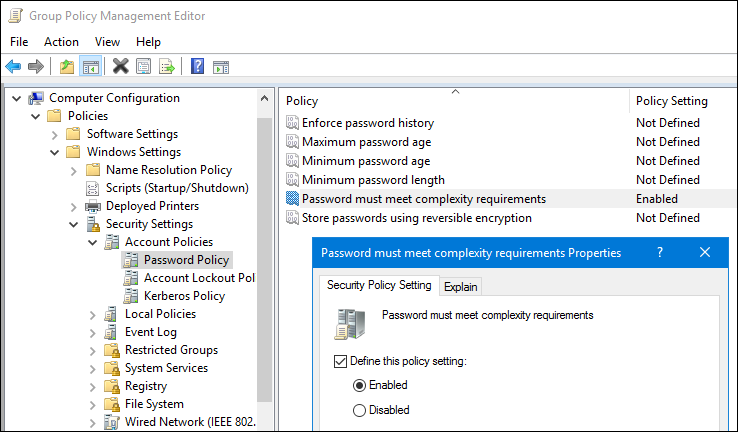 Navigate to Computer Configuration → Windows Settings → Security Settings → Account Policies → Password Policy, and double-click the policy named Password must meet complexity requirements. Enable the policy and click OK.
Close the Group Policy Management Editor and the Group Policy Management console. Configure TLS and set up a root CA on the AD server, as described in the Microsoft knowledgebase at http://technet.microsoft.com/en-us/library/cc772393%28v=ws.10%29.aspx#BKMK_AS1. In the Administrative Tools area, open Server Manager and add a role. 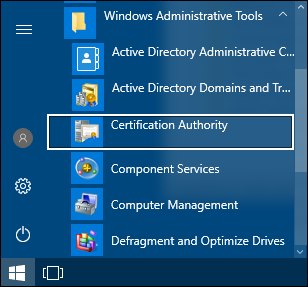 Select the Active Directory Certificate Services check box. Click through to the Select Role Services page, and select the Certification Authority check box. Set up the AD server to use the TLS server certificate. Subject = "CN=ad.server.example.com, O=Engineering, L=Raleigh, S=North Carolina, C=US"
If the command-line tool returns an error message, then use the Web browser to access the CA and submit the certificate request. If IIS is running, then the CA URL is http://servername/certsrv. Make sure that the server certificate is present on the AD server. In the Run menu, open the MMC console. Select the Certificates snap-in, and click Add to add it, and then click Next. Expand the Certificates (Local) menu on the left. Expand the Personal item and click Certificates. The new certificate should be listed with the other certificates. On the Directory Server, export the CA certificate. Copy the exported certificate from the Directory Server to the Windows machine. Import the CA certificate from Directory Server into AD. Open Administrative Tools and select the Certificate Authority item. Expand Trusted Root Certification Authorities. Right-click the Certificates item and select Import. Browse to the downloaded Directory Server CA certificate, and click Next. 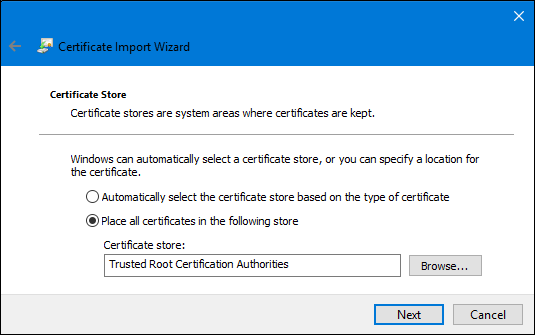 Save the CA certificate in the Trusted Root Certification Authorities store. To test that the server is running in TLS correctly, try searching AD over LDAPS. An AD user, specified in the sync agreement. The user specified in the sync agreement is the entity as whom the Directory Server binds to AD to send and receive updates. The AD user should be a member of the Domain Admins group, or have equivalent rights, and must have rights to replicate directory changes. For information on adding users and setting privileges in AD , see the Microsoft documentation. A Directory Server user, specified in the Password Sync Service. The user referenced in the Password Sync service must have read and write permissions to every entry within the synchronized subtree and absolutely must have write access to password attributes in Directory Server so that Password Sync can update password changes. The user cited in the sync agreement (the supplier DN) exists on the AD server. The user cited in the Password Sync configuration exists on Directory Server. Set an ACI that grants the sync user access to compare and write user passwords. For security reasons, the Password Sync user should not be Directory Manager and should not be part of the synchronized subtree. The steps to install the Password Sync service are described in the Installing the Password Sync Service section in the Red Hat Directory Server Installation Guide. For a list of operating systems Red Hat supports running the Password Sync service on, see Red Hat Directory Server Release Notes. The first attempt to synchronize passwords, which happens when the Password Sync application is installed, always fails because the CA certificate does not exist in Password Sync's certificate database. Adding the CA certificate is part of the configuration step of the application. Enable TLS in Directory Server. For details, see Section 9.4.1, “Enabling TLS in Directory Server”. TLS is required for Password Sync to send passwords to Directory Server. The service will not send the passwords except over TLS to protect the clear text password sent from the Active Directory machine to the Directory Server machine. This means that Password Sync will not work until TLS is configured. On the Directory Server, export the server certificate. Open a command prompt on the Windows machine, and open the Password Sync installation directory. > cd "C:\Program Files\Red Hat Directory Password Synchronization""
Create new cert8.db and key.db databases on the Windows machine. 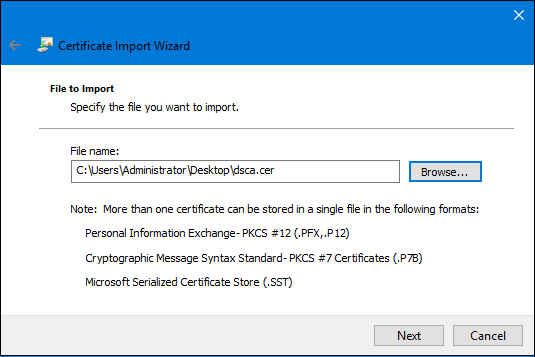 Import the server certificate from the Directory Server into the new certificate database. Verify that the CA certificate was correctly imported. > certutil.exe -d . -L -n "DS CA cert"
Reboot the Windows machine. The Password Sync service is not available until after a system reboot. If any Active Directory user accounts exist when Password Sync is first installed, then the passwords for those user accounts cannot be synchronized until they are changed because Password Sync cannot decrypt a password once it has been hashed in Active Directory. Just as with replication, there must be a changelog available to track and send directory changes and the Directory Server database being synchronized must be configured as a replica. If the Directory Server database is already configured for replication, this step is not necessary. Setting up a database for replication is described in Section 15.6.1, “Configuring the Read-Write Replicas on the Supplier Servers”. In the left-hand navigation tree, click the Replication folder. In the main window, click the Supplier Settings tab. Check the Enable Changelog database. Set the changelog database directory. Click the Use default button to use the default or Browse... to select a custom directory. After setting up the changelog, then configure the database that will be synchronized as a replica. 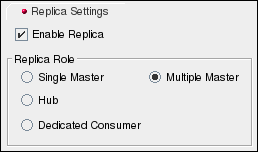 The replica role should be either a single-master or multi-master. While it is possible to configure a sync agreement on a hub server, this only allows uni-directional synchronization, from Red Hat Directory Server to AD. The AD server cannot sync any changes back to the hub. It is strongly recommended that only masters in multi-master replication be used to configure synchronization agreements. In the left-hand navigation tree, click the Replication folder, then click the name of the database to synchronize. By default, there are two databases, NetscapeRoot for directory configuration and userRoot for directory entries. Other databases may be listed if they have been added to Directory Server. Check the Enable Replica check box, and select the radio button by the type of replica which the database is. In the Update Settings section, either select or add a supplier DN. This is the user account as which synchronization process will be run. As mentioned in Section 16.4.3, “Step 3: Select or Create the Synchronization Identity”, this user must be on the Directory Server and must have the access right for the userPassword attribute of all users that are to be synchronized. Save the replication settings for the database. For more information on replication settings, see Chapter 15, Managing Replication. These different parameters are described in more detail in the Configuration, Command, and File Reference and Section 15.2.1, “Configuring Suppliers from the Command Line”. If secure binds are required for simple password authentication (Section 19.11.1, “Requiring Secure Binds”), then any replication operations will fail unless they occur over a secure connection. Using a secure connection (LDAPS or StartTLS) is recommended, anyway. In the left-hand navigation tree, click Replication, then right-click on the database to sync. The default user database is userRoot, but additional databases are added as new suffixes are added to the Directory Server. Alternatively, highlight the database, and in the top tool bar, click Object. 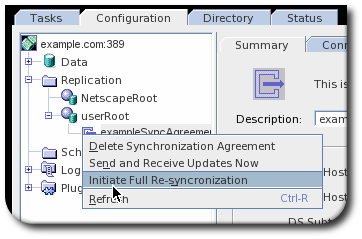 Select New Windows Synchronization Agreement from the menu. In the two fields, supply a name and description of the synchronization agreement. Hit Next. In the Windows Sync Server Info window, fill in the AD information in the Windows Domain Information area. The name of the Windows domain. What kinds of entries to synchronize; users and groups are synchronized independently. When a type of entry is chosen, then all of the entries of that type that are found in the Windows subtree are created in the Directory Server. The Windows and Directory Server subtree information; this is automatically filled in. Use LDAP. This sets either a standard, unencrypted connection. Use TLS/SSL. This uses a secure connection over the server's secure LDAPS port, such as 636. 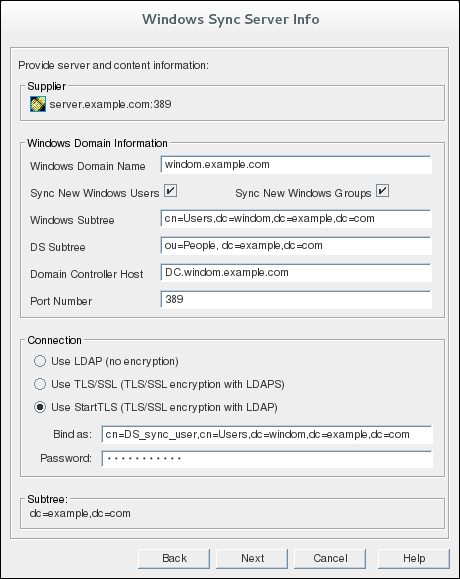 Both the Directory Server and the Windows server must be properly configured to run in TLS for this connection and must have installed each other's CA certificates in order to trust their server certificates. Use Start TLS. This uses Start TLS to establish a secure connection over the server's standard port. Like regular TLS, these peer servers must be able to trust each other's certificates. Using either TLS or Start TLS is recommended for security reasons. TLS or Start TLS is required for synchronizing passwords because AD refuses to modify passwords unless the connection is TLS-protected. Fill in the authentication information in the Bind as... and Password fields with the sync ID information. This user must exist in the AD. By default, Windows Synchronization polls the AD peer every five (5) minutes to check for changes. In the sync agreement summary, this is displayed as the Update Interval. The update interval can be changed by editing the winSyncInterval attribute manually. See Section 16.12.2, “Adding and Editing the Synchronization Agreement in the Command Line”. When the agreement is complete, the new sync agreement is listed under the suffix. It is also possible to add the sync agreement through the command line. For descriptions of the parameters used in the example and other attributes you can set, see the Red Hat Directory Server Configuration, Command, and File Reference. Add the ntUser and ntGroup object classes to any user and group entries, respectively, which will be synchronized, along with any required attributes. Only Directory Server entries with those object classes are synchronized. AD entries which are synchronized over to Directory Server have those object classes automatically. Whenever the appropriate object classes are added to an entry, both for new entries and existing entries, the entry is synchronized over at the next incremental update. Configuring Directory Server user entries for synchronization is described in Section 16.5.3, “Configuring User Synchronization for Directory Server Users”, and configuring Directory Server group entries for synchronization is described in Section 16.6.4, “Configuring Group Synchronization for Directory Server Groups”. After the synchronization agreement has been created, start the synchronization. When the initialization is complete, Directory Server automatically removes the nsds5BeginReplicaRefresh attribute from the replication agreement entry. Go to the Configuration tab in the Console. Open the Replication folder and expand the appropriate database. Right-click on the agreement or open the Object menu. If synchronization stops for any reason, begin another total update (resynchronization) by selecting this from the sync agreement menu. Beginning a total update (resynchronization) will not delete or overwrite the databases.